To better capture the experience of our work we will often try to create time lapse movies. This is done by mounting an iPad with a time lapse application above our work and setting it to take a picture about every 18 seconds. Then all of the images are put together to form a relatively smooth series of pictures. They are fun to watch. Enjoy! Game of Throne fans have to get their fix, especially if they are waiting for the next season to come out. 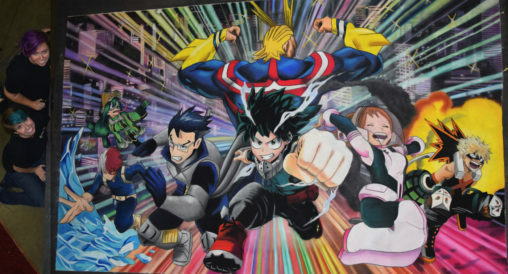 This 7’x8.5′ soft pastel on canvas painting includes many of the main characters from the cast as well as the symbols for each of them main houses. Bleach was the first anime we ever watched. This time lapse video was taken at Tora-Con in Rochester, New York. The finished piece was 6’x8′ and took about 30 hours to complete. 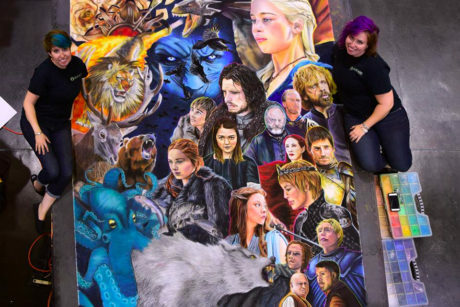 This giant 7’x11.5′ mural was completed over four days at Anime Expo. We had fun creating this 7′ x 8.5′ chalk drawing at Fan Fest Portland. 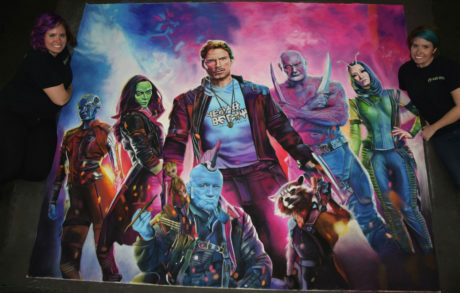 Our work was only briefly interrupted when Michael Rooker stopped by to see our rendition of him as Yondu. She Hulk, Mrs. 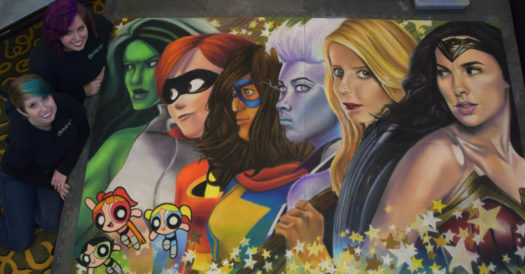 Incredible, Ms. Marvel, Storm, Buffy and Wonder Woman all make their appearance in our tribute to female super heroes. Completed at GalaxyFest in Colorado Springs, the final piece was 5’x7′ and took about 25 hours in total. 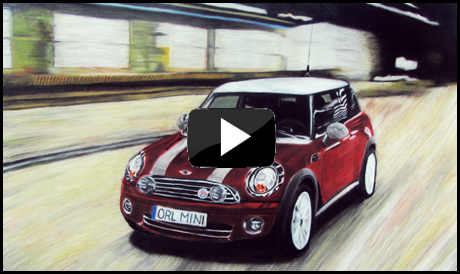 A chili red Mini Cooper chalk art piece we did for the annual Mickey and MINI 8 event held at the Richard Petty Experience at Disney. Done in approximately 7 hours, the piece is 4′ x 6′ and was donated to Orlando Mini. 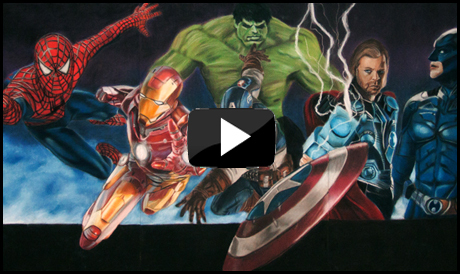 This 4′ x 8′ piece we did for Dragon*Con was meant to show all of the summer comic book movie hits including The Amazing Spider-man, The Avengers and The Dark Knight Rises. No matter if you are a Marvel or DC fan this video shows a portion of what we did during the show. 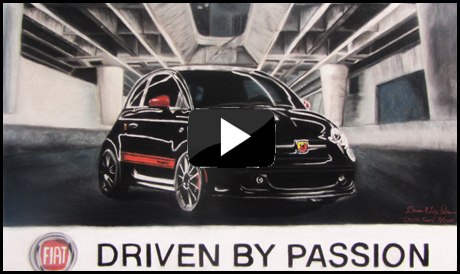 We had six hours in the Fields Fiat of Orlando studio to complete this 4′ x 6′ picture. We think it turned out great and they were very happy to take ownership of the piece after their one year anniversary party. Our first time lapse was done at Florida Anime Experience. 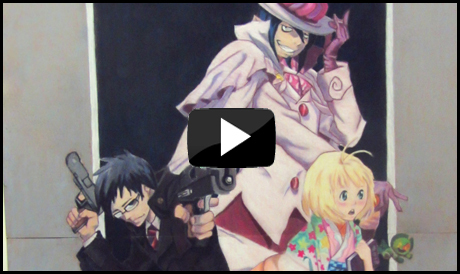 The piece is a montage of characters from a great anime, Kazue Katō’s Blue Excorist. Done over three days, the piece is large at 6′ x 8′ but we wanted to create something epic.